Edited by gooddealgames, Thu Nov 10, 2016 2:53 PM. 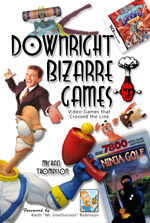 OMG, it covers Ninja Golf...do I detect another book going on my Christmas want list? So it's just about home games? I ask because otherwise the arcade game Chiller is a big omission. Ah, the first "you're missing x" post. I was expecting this inquiry. The omission is intentional. The book was designed with North American console games in mind. If successful, a second volume containing coin-op, imports, PC, etc. will be released. Thanks to those that have expressed an interest or already picked up a copy. I TRULY appreciate the support. I thought as much. Thank you for the response. Sgt. Hulka is our big toe. A Dog's Life was a great game. Unconventional, perhaps, but good. Yeah, Mr. Mosquito. Never really figured that out. Surprised I didn't see "Aquanauts Holiday" or "Tail of the Sun" on the list. Again, good games but not very typical. Kind of an Ecco vibe. Curious why Smash TV made the list though. Maybe just the backstory? I was curious about Smash TV as well. I'm sure it's the story. Smash TV is the unofficial sequel to the duel-stick shooter Robotron: 2084, also designed by Eugene Jarvis. The game’s story line is loosely based on The Running Man, a 1987 film based on a novel penned by horror author Stephen King. The game says very little, but when it does it throws out cheesy catchphrases like “Total Carnage, I love it!” or “I’d buy that for a dollar!” The latter being a nod to Bixby Snyder, the fictional TV host that appeared in the film RoboCop. The contestants mow down hordes of attacking enemies using rocket launchers, grenades, smart bombs, and spinning shurikens, all while the audience cheers on the player. There is a seemingly endless wave of assailants comprised of tanks, various snakes including the Cobra Twins, and “gentlemen” such as Mr. Shrapnel, Scarface, and The Mutoid Man. Making a cameo are the Robotron Grunts disguised as Hulk Clubbers.